Flowering quince (Chaenomeles) is a very colourful tree in the spring with an abundance of flowers appearing all over the tree. This tree was purchased in the spring from a garden center near Helsinki. 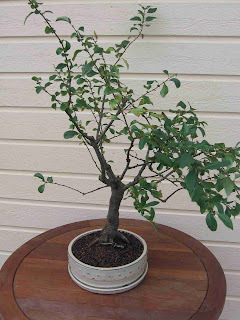 I repotted the tree in August because this is the recommended time for this tree, and not in the spring. 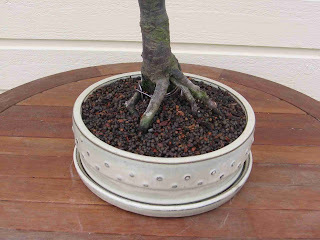 This late repotting time is acceptable because it will not be spending the winter outside. Quinces (Ruusukvittenit) do not like anything less than 5°C so I will be moving it into my house for the winter in the coming weeks when the temperature starts to get colder, for now I have moved it in our glass pavilion so it still get good sun light and stay warm at the same time. 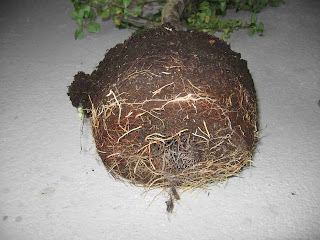 Below is a photo of the root ball when first removed from the old bonsai pot. 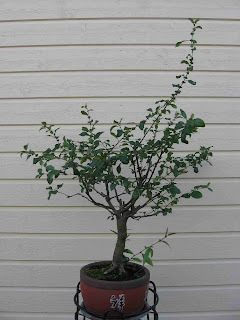 The bonsai pot that the Quince came in was very nice but I wanted to put it into a more shallow pot. I decided still to use a round pot but one with less height. 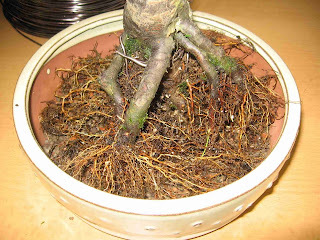 The roots were just perfect to fit into this pot and were nicely spread with many fine roots. Even though they do not like the very cold temperatures they still need a level of temperature change to ensure that flowers come in the spring. I hope this will be good enough before the really cold temperatures arrive here in Finland. We shall see in the spring if it worked. In the below photo you can see a close up of the soil mix used. It was a mix of the new fired clay with some cat litter and pine bark.